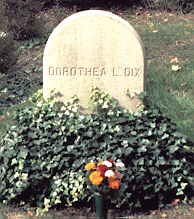 Dorothea Dix was not a nurse. She was a tireless and effective mental health reformer at a time when the mentally ill were treated as criminals. Born in Maine in 1802, she lived with her grandmother after the age of 12 and began teaching school at the age of 14. She published several books for children which were successful and had several bouts of illness due to over-work. It was in 1841 when she volunteered to teach a Sunday School class to women at the East Cambridge house of corrections that she began her crusade for mental health reform. She traveled the eastern half of the country alone, inspecting asylums, poor houses prisons and other sites where the mentally ill were housed. She then petitioned states to provide funds for the proper facilities. Miss Dix was renown for her work and she had many friends of considerable influence. When the Civil War broke out, at the age of 59, she volunteered her services and was subsequently appointed superintendent of the army nurses. Because of her autocratic style and lack of experience she was not well regarded and was relieved of this position. Miss Dix returned to the Trenton State Hospital, which she considered her home for the last six years of her life. She died there April 4, 1887 at age of 85 and is buried in Cambridge, Massachusetts. Brooks, G. (1957). Three wise virgins. NY: EP Dutton. Herrmann, F.M. (1981). Dorothea L. Dix and the politics of institutional reform. Trenton, NJ: NJ Historical Commission. Marshall, H. E. (1937). Dorothea Dix forgotten Samaritan. Chapel Hill, NC: Universitry of North Carolina Press. Stein, A. P. (1988). Dorothea Lynde Dix. In: American nursing: A biographical dictionary. V.L. Bullough, O.M., Church, & A.P. Stein, (Eds.). New York: Garland.